If you're carrying a first generation Moto X, E, or G LTE, then you've likely noticed a distinct lack of Lollipop running on your device. 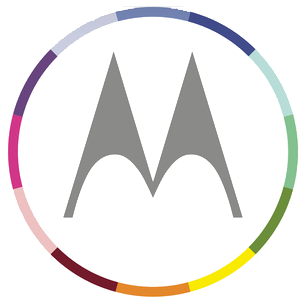 The main reason for that is, well, because Motorola has been testing the 5.0.2 update in several markets over the past several weeks, but it still hasn't released it publicly. 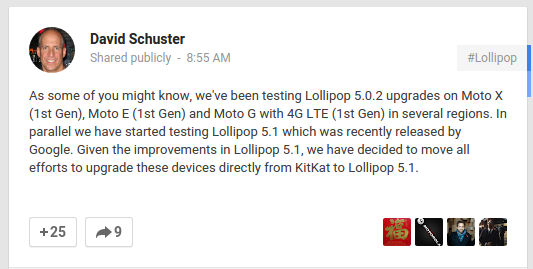 According to Motorola's David Schuster, they've also been testing 5.1 on the aforementioned devices in tandem with 5.0.2, and now the company has decided to skip 5.0 altogether and bump those devices directly to 5.1. A similar announcement was made back in mid-March regarding the DROID Turbo, so it's really not much of a surprise to see the same strategy used here. While that in itself is pretty good news, there was unfortunately no mention of a release timeline. The downside is that it'll probably take them just a bit longer to get this update ready to go than if they'd just stayed with 5.0, but I guess it'll all be worth it in the end when everyone has the latest OS out there.